Pay homage to one of England’s most infamous kings in Battle Royal. Based on Henry VIII and his 6 wives, it’s a 5 reel, 20 payline video slot from Play ’N Go. This high variance game comes with top design and some interesting extras. Look out for mystery transforming symbols, free spins with wild extras and a pick me round. Play on your PC, tablet or mobile from between 20p and £100 per spin. The design in Battle Royal is very nicely done. The action takes place in a grand room of a palace. There you’ll find lower value playing card suit symbols plus Henry’s 6 wives. All of the higher value wife symbols spin in 2-high stacks. The best of them pays 2, 10 or 30 times your bet if you land 3, 4 or 5 in combination. Henry VIII is the wild. Like his 6 wives, he spins in 2-high stacks. Land 3, 4 or 5 wilds on a payline and you’ll receive an award of 2, 10 or 30 times your stake. Spicing up the base game action is the Royal Flush feature which can trigger at random. All of the hearts, diamonds, clubs and spades all transform into the same suit symbol and a new payout is made. Heads Will Roll Free Spins feature – before the round begins, pick a wife. This could land you an extra prize at the end of the round. Once the free spins begin, look out for the guillotines that can drop. If they land on a reel that feature a full queen or just the top half of a queen then she’ll get the chop and turn into a wild for the rest of the feature. If only the bottom half of a queen is visible, then she won’t be eligible to become wild. The free spins continue until just 1 queen is left standing. If that last remaining queen matches the 1 you picked at the start of the round, then you’ll be in for a special bonus prize. To finish the round, select a guillotine. If the final Queen survives the round is over. If she doesn’t, you’ll go on to play the Long Live The King feature. Long Live the King feature – you can activate this pick me round from the free spins or directly via the scatter pick. Choose from the chests to reveal prizes. After each pick, a ghost will fly across the reels. If the ghost hits Henry, the round ends. As well as cash prizes, the treasure chests could also contain a key. This allows you to escape the dungeon with a multiplier that is applied to your total win. We recommend you take this option as soon as you can if you triggered this feature from the free spins round – this allows a multiplier to be applied! You might do better by carrying on picking if you opened the feature via the scatter. If you like high variance action, then Battle Royal should definitely appeal. The volatility here is sky high so expect some lengthy barren spells. The wilds can really work their magic in the bonus round though to the tune of 5,000 times your bet on every free spin! We enjoyed this historical adventure. The visuals are excellent the range of extras on offer delivers plenty of potential. 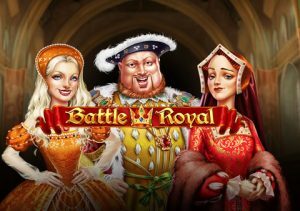 Get on a roll with the extras and Battle Royal can deliver some action fit for a king. If you like medieval adventure, WMS’ Black Knight II should do the trick – and it’s highly volatile.